Geetaji’s 2nd Convention in South Africa took place in Gauteng, 7 – 11 May 2011. Geetaji is the eldest daughter of Shri BKS Iyengar and is a scholar and master of Yoga, Philosophy and Ayurveda in her own right.The convention was preceded by a lecture given by Geetaji at the Linda Auditorium, Wits. Sunita, Geetaji’s sister did the Puja followed by an impressive demonstration performed by a group of Gauteng yogis. Geetaji began by saying how her father had to go through the “fire”. He went to Mysore where he met his teacher who made him do yoga. He was unaware of yoga before that, but after being shown a few postures over a short time he was made to demonstrate in front of audiences. He did balances, jumps and 40 to 45 Surya Namaskars. He suffered many injuries along the way and learnt the process of internalisation. Geetaji explained that each letter of the name “Iyengar” could be said to represent a word/s. “I” stood for internalising and integrity. “Y” stood for the yoking process, yoking the body to the mind and the mind to the soul. “E” stood for enthusiasm and the energy within. “N” stood for nurturing and yoga being a nourishing process. “G” stood for global purification of the body and of the world and also for grace bringing beauty and harmony. “A” stood for auspiciousness, awareness in the body working from the outside inwards, attention and adjustment. ”R” stood for righteousness, reasoning, reflecting. No asana is done without reflection. Geetaji went on to say that the ‘eight steps of yoga’ is a long journey with Yamas and Niyamas being the tracks of the train in which we travel to Samadhi. Geetaji stated how BKS Iyengar had introduced props to show compassion towards his students and that the props bring about consciousness so that all may benefit. Saturday dawned, and so began the first day of the Convention which was open to students from all schools of yoga. Geetaji explained the prayers and said that we have to be honest and humble in our approach. She began with seated asanas as we were all already seated. We had to make the buttock bones “sharp” and press them down to make the petals of the brain open in order to reach kundalini. Lifting of the lower sacrum was a very important action. We then did standing asanas. An interesting approach to Utthita Trikonasana was starting in Prasarita Padottanasana with the arms stretched forward, walking the arms round to one leg, taking one arm up to the ceiling and rotating the trunk into Trikonasana and repeating to the other side. We returned to seated asanas, then Setu Bandha Sarvangasana with sacrum supported on 4 foams, a twist and Savasana. After lunch Raya from Pune performed an impressive demonstration interspersed with philosophy and his experiences along the yogic path with Guruji. He stated that for him it was a privilege to be able to perform in front of Geetaji. He is a very modest and humble man. Geeta taught Pranayama that afternoon. She introduced prone and seated Ujjayi with Jalandhara Bandha and Kumbhaka. Geetaji is so adept at teaching multi level asana and pranayama classes. She is able to teach beginners at their level and at the same time impart knowledge to long standing practitioners of how to teach beginners. The second day, Sunday, started with Pranayama. Needy participants were shown how to do Pranayama on a chair. Adjustments to the body in prone position were given. The instructions when doing Antara Kumbhaka were ‘to lift the bottom rib cage, shoulder blades and dorsal spine in, open the intercostal muscles and “explode” the chest’. The tea break came all too quickly followed by asana – standing poses, Sirsasana, Adho Mukha Virasana, Setu Bandha Sarvangasana and Savasana. Adho Mukha Virasana was done with varying support for the head, the arms and the hands. Geetaji said that alignment of the spine is very important here as when the spine is aligned the chakras are aligned. Geetaji introduced yoga sutras during the asanas. After lunch Sunita lead us in chanting all the Yoga Sutras of Patanjali. I must add that we all looked forward to a quenching cup of tea after that. Monday, the third day, started with Pranayama. We were seated on chairs with our legs through the back of the chair. Pregnant ladies sat with their legs astride of the arms of the chair. Firstly we held the arms of the chair while doing Ujjayi and Viloma. Then we held the seat of the chair from behind and repeated Ujjayi and Viloma. Instructions were to let the throat recede and not push it forward and to watch the top larynx. Geetaji helped an elderly lady to open her chest by seating her with her back against the tressler with her arms over the tressler and sufficient support under her buttocks. A strap was used to lift her diaphragm from the back to the front. Then we did Savasana followed by a break. The asana class which followed focused on inversions – Sirsasana and Sarvangasana and preparations for the inversions. Students who had issues worked with helpers on the stage or at the tressler. Pregnant women should not start with a Sirsasana series. During Sirsasana Geetaji gave the instruction to go up and to come down with the legs bent and together and moving through Virasana legs. The shoulders and top ribs move towards the bottom ribs and the bottom ribs move towards the top ribs, (shoulders), as demonstrated by Raya. When going from Halasana into Sarvangasana the hands should be placed on the back before the legs are taken up into Sarvangasana. After the asana class and lunch break we gathered in the hall to chant the 108 names of Patanjali lead by Sunita. The rest of the afternoon was taken up with “Questions and Answers”. I have abbreviated Geetaji’s full and descriptive answers. A complete recording will be available on DVD. What is the significance of chanting? Chanting brings devotion to the Lord. It causes one to raise the voice and thereby clears the voice and chest. Is it correct to work a limb/joint with arthritis? The joint needs to be kept moving. Raw foods especially cucumber are bad for arthritis. Patients have a fear complex and are nervous. If possible, standing poses should be performed with support to give confidence. Restorative postures are important. Geetaji explained many alternatives for Spondylosis of the neck. One of them was ‘neck traction in the ropes’. Geetaji was asked how one should treat a student with an ovarian cyst. One has to create vertical extension in the abdomen while the abdomen in supported. Geetaji demonstrated how to assess the alignment of a student’s body and how to correct it. She made it seem so logical and easy but without her guidance it was not so obvious. Tuesday, the fourth day, began with supported Savasana followed by Pranayama – Ujjayi 4. Geetaji emphasised the lift of the chest to be very important – “desa”. Then she went on to explain the function of the fingers in digital pranayama, right and left hands. We practised Surya Bhedana, Chandra Bhedana, preparation for Nadi Sodana and finally Bhastrika. Strange how foreign it feels to use the left hand in digital pranayama when the right hand feels so comfortable. The session ended with Savasana and a juice break. The beginning of the asana session consisted of ‘twists’. Geetaji said ‘to use the eyes to turn’. The twists led us into ‘back bends’. In Urdhva Mukha Svanasana there should be no lumbar compression and the buttocks should be soft. Consciousness has to come to the surface – viveka. In Bhujangasana focus on the dorsal curvature and bring outer edges of the ribs closer to each other – this is required for all advanced ‘back bends’. The head should be taken back last in Ustrasana to maintain the lift of the sternum. When moving from Urdhva Dhanurasana into Dwi Pada Viparita Dandasana, before bringing the head down tilt the head back to look towards the feet and lift the pelvis and dorsal back at the same time. One felt exhilarated after the class and enjoyed Savasana lying flat on the floor. Lunch was much appreciated. The afternoon was reserved for Remedial yoga in which students could present their problems to Geetaji. Geetaji’s knowledge and experience is extraordinary. She was able to help each one in her stride with problems like: degenerative hearing, postural adjustment, osteoporosis, reflux, pregnancy, shoulder replacement, over supple bodies, over stretch of the knees and inner ankle bones that drop. Geetaji suggested we read Sutra 111:56 sattva purusayoh suddhi samye kaivalyam iti – When the purity of intelligence equals the purity of the soul, the yogi has reached kaivalya, perfection in yoga. There was one other question which was “why do yogis use incense”? The questioner was expecting a long and spiritual reply. Geetaji answered with a wry smile and a twinkle in her eye “to give a pleasant fragrance”! Wednesday, the last day. We sat for the prayers and a short meditation then went into Supta Baddha Konasana with enough support under the back to open the bottom ribs. This was followed by Virasana on support to separate the highs from the torso, Maha Mudra and Savasana. This was our preparation for Pranayama. We began with seated Bhramari in which the sound starts at the top and middle larynx and descends to the lower larynx. Bhramari gives a release to the peripheral nervous system. Then we did Bhastrika followed by Kapalabhati. Savasana was done with support, if required, if the chest felt as if it were sinking after the Pranayama. There was a tea break and then came our last asana class of the convention. We did standing poses and Sirsasana with variations, Surya Namaskars – slow enough to be aware of the correct actions, chair Viparita Dandasana with varied support, a twist, chair Sarvangasana, Ardha Halasana, and Swastikasana with head resting on the chair and finishing with Savasana with calves resting on the seat of the chair. 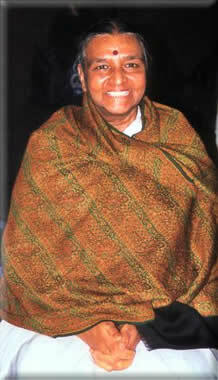 After completion of the asana class Geetaji addressed us and passed on many gems of wisdom. Sunita performed the Puja – asking the Lord to bless us and the work we had done. We chanted Jaya Deva, Jaya Deva. We all filed passed Geetaji and made our acknowledgements and with a joyous yet heavy heart I left the hall with my goods and shattles to begin my journey back to Cape Town, enriched with all the knowledge that Geetaji so willingly imparted to us.